p38a from other species may also be detectable. Stability :Store at 4°C (add 0.1% NaN3) for several months, and at -20°C for longer periods. For optimal storage, aliquot target into smaller quantities after centrifugation and store at recommended temperature. For most favorable performance, avoid repeated handling and multiple freeze/thaw cycles. 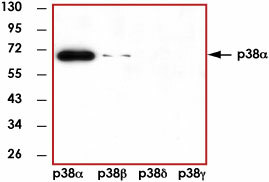 Representative western blot (1:1000) using 20ng of p38α, p38β, p38γ, and p38δ recombinant protein. Scientific Background :p38α (SAPK2A) is a member of the p38 MAPK family which are activated by various environmental stresses and proinflammatory cytokines (1). The activation of p38 requires its phosphorylation by MAP kinase kinases (MKKs), or its autophosphorylation triggered by the interaction of MAP3K7IP1/TAB1 protein with this kinase (2). The substrates of p38 include transcription regulator ATF2, MEF2C, and MAX, cell cycle regulator CDC25B, and tumor suppressor p53, which suggest the roles of this kinase in stress related transcription and cell cycle regulation, as well as in genotoxic stress response (5). References :1. Han, J. et al: A MAP kinase targeted by endotoxin and hyperosmolarity in mammalian cells. Science 265: 808-811, 1994. 2. Ge, B. et al: MAPKK-independent activation of p38-alpha mediated by TAB1-dependent autophosphorylation of p38-alpha. Science 295: 1291-1294, 2002.